It’s an honor to announce that The Penguin Press today released Farm City, the paperback!!! It’s only $16, which makes it affordable for students and other scrappers (like me) who often can’t afford a hardcover book. I’ve heard that someties they just don’t print the paperback version, and that’s the end of the book. What a relief! I’m also so happy when nice bloggers are still writing good things about Farm City. 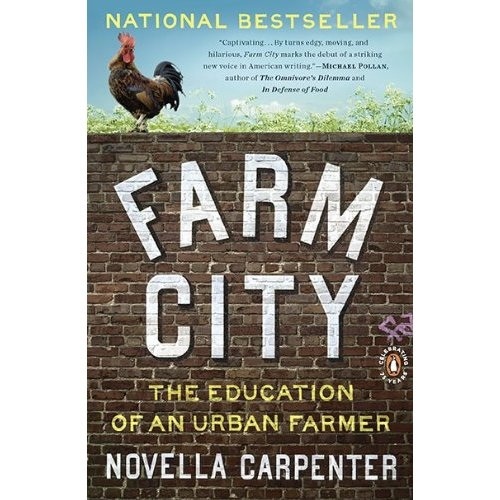 Holy crap–Farm City got nominated for a Northern California Book Award! Woot!!! Filed under food writing. I’m so honored. Cross your fingers. I remember when I first signed my contract for Farm City. It was 2007, and I thought: holy crap, I have to wait two years before it comes out? Seemed like forever. The hardcover came out the summer of 2009, and it has been such a great ride. I’m so humbled and thankful for all the great reviews and accolades FC has earned this year. Below are my goals and new schedule for touring and events to support Farm City. Speaker’s Bureau. I’m signing up to be part of Penguin’s Speaker’s Bureau. The idea is they’ll book gigs for me on college campus and town libraries, so I can come talk about Farm City and urban farming. FC is also part of the offerings for the first book incoming college freshmen read, so they can bond. Why didn’t I have that back in the day? New Schedule. I’ll post it on my schedule page, too, but here’s where I’ll be this next year (so far). February 27. Morgan Hill Library reading. March 13. Tucson Book Festival. May 15. Shelton, WA, Write in the Woods; my hometown’s writing workshop! New Book. Yup, there’s a new book–well, actually two, in the works. The first is a how-to manual for urban farmers, written by me and Willow Rosenthal; it’s due out February 2011. The other is another memoir but this time focusing on my father and wild things. Then I’ll finally stop writing memoirs, and start in on novels. Whew! New York Times Top 10! Dwight Garner, whoever you are, I love you. Two vegetarians vs. Two meat eaters. Guess which side I was on? Yep, it was a good old fashioned Texas showdown! As part of the amazing Texas Book Festival, I was invited to be on a panel moderated by the effusive and lovely Corby Kummer. My fellow panelists were Jimmy McWilliams, a professor and author of Just Food. He argues that local food isn’t all that good and that GM crops might be a boon for our society. He also thinks meat eating should cease. Effective immediately. Jonathan Safran Foer is the stellar novelist who recently published a book about his emotional and philosophical issues with meat eating. Finally, there was Jason Sheehan. A total card/character/really great columnist for Westword in Denver. He actually said, “if my customers like meat that was fed eagle eggs, then I’m serving it.” Even the wild west of Austin grew silent at this, then they laughed. Appropriate response. Then there was me. Like ham in a man sandwich. In the end, I decided the JSF and I have more in common than most vegetarians and carnivores. The whole idea for me, is animal welfare. I want them to have a good life and then they will be more tasty. JSF maybe wants them to stop being tortured on factory farms. It’s not rocket science, he is right. If vegetarians and supporters of good meat could come together, things might just change. The best part of the whole thing? We got to take over the House Chambers, a giant room where laws get made. I wondered out loud why the public and people like me were allowed to take over the Capitol for Book Fest every year. Turns out the Texas legislature only meets every other year. “If they met more often, they’d just make too many laws,” a young buck explained to me. Ha ha. First of all, my dear friend and blogger, Kate, lives there. When I was first invited to come to Madison for the Book Festival, I imagined I would be bedding down at the local Motel 8. Luckily, Kate moved last month from Juneau to a charming apartment on the isthmus. And, she’s found work doing gardening. I spent one day with her deadheading, harvesting apples and kale, eating grapes, and weeding said grapes. We found lots of mushrooms while working. Second of all, Madison is a really cool town. Lots of cafes and bars. We had great food–crepes and coffee downtown, cheese from Fromagination, and foraged apples (Wisconsin apples are as good as those from Washington State). Third of all, the wonderful Lee of Pamplemousse Preserves. She came to my reading, introduced herself, and thrust jars of preserves into my hands. Oh my god, the tomato jam with nigella seeds is unbelievably good! We ended up spending time at her new cafe, Ironworks Cafe at the John Goodman Center, which is a neat new community center in Madison. Holy god, the fresh English muffins. Yummers. Finally, my reading at A Room of One’s One, was really fun. Packed room, lots of laughter, great intro from Robert Pierce of Growing Power Madison, Michelle Widgen, and an enthusiastic, food-obsessed audience. It was the first time an audience member asked me specific details about the meat curing process. And how lucky they are in Madison: the chilly temps are perfect for hanging meat at home. On my trip back to the airport, the cab driver told me he was reading Daniel Defoe’s Journal of the Plague Year. So he could compare Defoe’s experience with the Plague versus today’s Swine flu epidemic. Not your typical town…. P.S. I also traveled to Chicago and Milwaukee, mostly to meet farmers and see urban farms. As I tour around, I’ll be showing slides of stuff I saw at these particular farms. My goal has been to travel around the US and meet my fellow urban farmers. I’m so glad that this October and November, I’ll be visiting many cities. Dates in italics are not yet filled, and I have added suggestions for places I want to go. If you live in one of those cities, drop a line, and we’ll see if I can spread out a little more. October 8, Madison, Wisconsin, Reading, Wisconsin Book Festival, A Room of One’s Own, at 307 W. Johnson Street, 5:30. November 14, 15, 16, 17 NYC? Thank you everyone who helped organize this, especially Hamida!